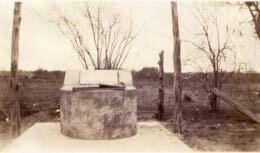 A century after the formation of the town, the people of San Felipe decided to create a memorial park. Led by school superintendent W. S. Smith, the Town Council dedicated six acres around the original public well as a historical park in September 1927. Community members formed the San Felipe Park Association to harness volunteers to develop and operate the park. At the formal dedication of the park one year later, the school children of Austin County unveiled an obelisk that they had funded, Austin County commissioners provided a granite monument dedicating the park, and the Sealy Chamber of Commerce funded the restoration of the historic well. 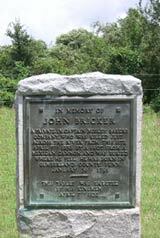 Additional elements were added to the park in the years surrounding the 1936 Texas Centennial, including a monument commemorating the death of soldier John Bricker in the 1836 battle at San Felipe, and an historical marker on the site of the Town Hall that hosted the Conventions of 1832 and 1833 and the Consultation of 1835. A log cabin replica of Stephen F. Austin's home and land office was constructed, and by 1938, a large bronze statue of Austin sculpted by John Angel was also unveiled at the park. Educator and historian George W. Hill led the Park Association during its important years of development from the 1930s to the early 1950s. In 1940, the Town of San Felipe and the San Felipe Park Association donated the commemorative park to the State of Texas, which opened it as the Stephen F. Austin State Park. The Park Association changed its name to the Stephen F. Austin Park Association and assisted the site's development. In 1964 the Park Association moved, restored and opened the 1840s Josey Store building as a museum on the site. 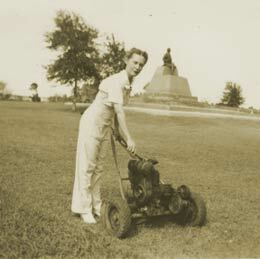 Carrie May Ferrell mowing the State Park in it's early years. 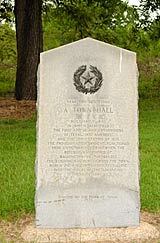 In 2002 the site was transferred to the Texas Historical Commission, and in 2008 the park was renamed the San Felipe de Austin State Historic Site. Reflecting the change in name for the historic site and the management by the Texas Historical Commission, the Stephen F. Austin Park Association changed its name to the Friends of the San Felipe de Austin State Historic Site.